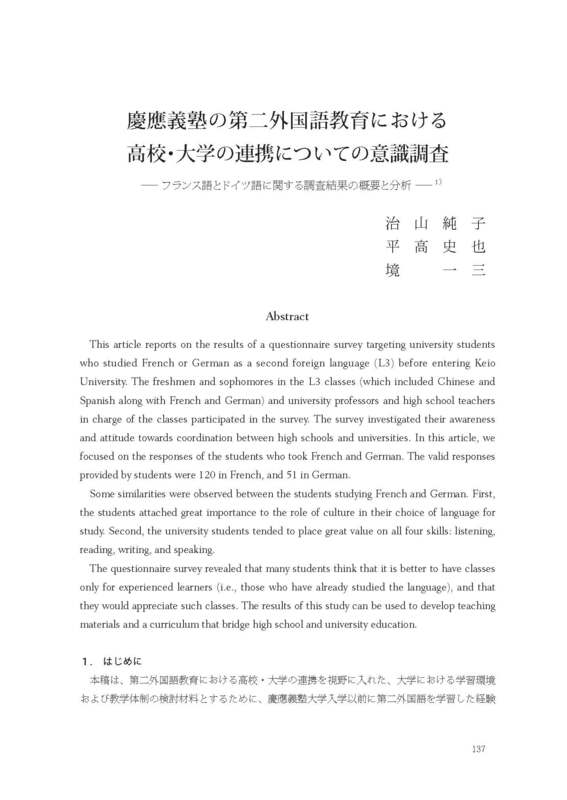 This article reports on the results of a questionnaire survey targeting university students who studied French or German as a second foreign language (L3) before entering Keio University. The freshmen and sophomores in the L3 classes (which included Chinese and Spanish along with French and German) and university professors and high school teachers in charge of the classes participated in the survey. The survey investigated their awareness and attitude towards coordination between high schools and universities. In this article, we focused on the responses of the students who took French and German. The valid responses provided by students were 120 in French, and 51 in German. Some similarities were observed between the students studying French and German. First, the students attached great importance to the role of culture in their choice of language for study. Second, the university students tended to place great value on all four skills: listening, reading, writing, and speaking. The questionnaire survey revealed that many students think that it is better to have classes only for experienced learners (i.e., those who have already studied the language), and that they would appreciate such classes. The results of this study can be used to develop teaching materials and a curriculum that bridge high school and university education.